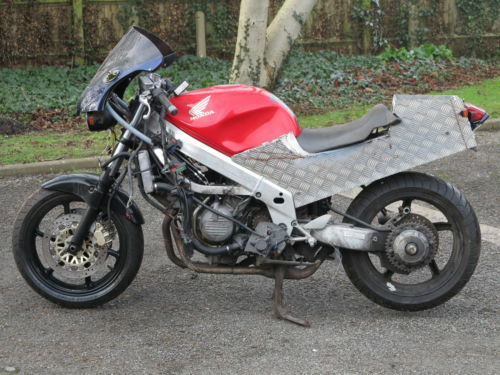 eBay – a simple auction website where discerning buyers can hunt the adverts to snag, among other things, a bargain ‘Winter Project‘ bike that turns out to be a frame number written on a beer mat and a box of rusty imperial size bolts. Genuine rusty imperial bolts, but rusty nonetheless. We’ve all been there – a little too much enthusiasm, a gross underestimation of how long the proverbial ‘five minute job’ actually takes and before you know it you’re driving to Yorkshire to pay £100 for a rusty old sidecar that you’ve no idea what to do with. It was on one such foolish expedition around the sub-£500 search results that I stumbled across a bike so original, so ‘out there’ in its design and execution, that I would be a selfish man to keep it to myself. 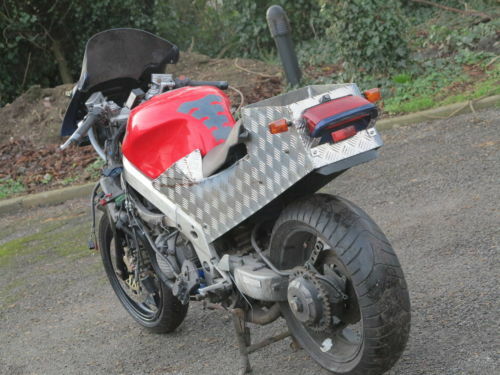 So, feast your eyes on the Honda VFR750 special below and tell me you aren’t inspired.